Poke is the new wave. You cant go far without seeing a Poke place opened or soon to open. And recently in Madison Poke restaurants have been opening left and right! 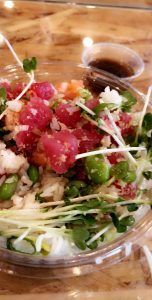 One of my favorite Poke places is Poke Plus & Teriyaki. The restaurant, which opened only six weeks ago, has already become a popular dining spot for UW-Madison students. With 15 reviews and five stars on Yelp Poke Plus & Teriyaki is already proving its value on campus. 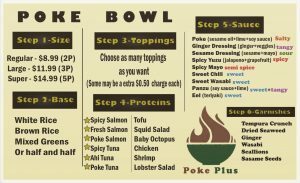 Located at 615 State Street, it is the only Poke bowl located directly on state street, giving the restaurant an advantage over competitors as its so accessible to students and locals. 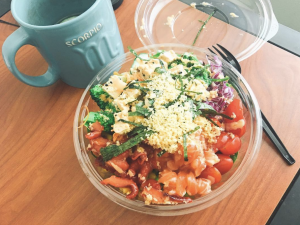 Poke is a quick and light lunch that students are able to grab to go or sit and eat with friends. The service is fast and the food is very customizable and easy to order. Not to mention the price point is very reasonable for Poke and for students with the perfect amount of food customers are given. My favorite part of Poke Plus & Teriyaki is their sauce options! The restaurant has nine sauce options – all different and unique – making the fish and rice combination extra delicious. You have the ability to combine as many sauces as you desire and each is great in its own way. Not to mention the variety of toppings and fish options offered. I am from Los Angeles and LA is known for having fresh fish and seafood. I genuinely believe that the fish from Poke Plus & Teriyaki is quality and comparable (if not better) than some Poke restaurants located in Los Angeles! Have a Pep in Your Step During Long Walks to Class! Excuse Me, Did You Say Russian Dumplings?